Golden tag that reads "Oh Deer 10/31"
Are you tired of being called a “dear” by everyone you meet? Sure, you’re a super helpful, super conscientious, super welcoming, super friendly guy. But you do know what they say about nice guys, don’t you? 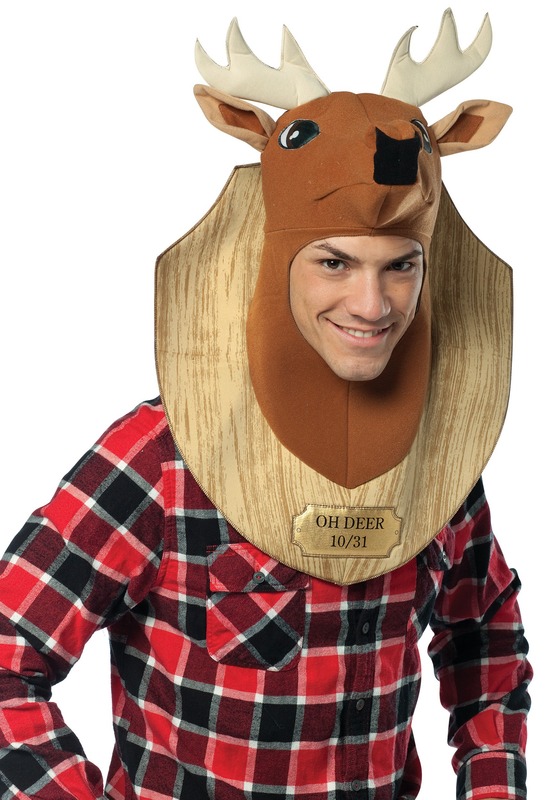 Well, show everyone that you have a bit of brute in you (not to mention a sense of humor and an ability to distinguish common homonyms) in this Trophy Head Oh Deer Costume. A super nice guy like you would never hurt a sweet little deer--in life. But in Halloween land, where up is down and alter egos run amok, you are a master hunter with a glorious wall full of taxidermy trophies. Now you can look just like one of those prized trophies, and delight your pals with your witty play on words, all at once! You’re not a “dear” tonight; you’re a buck--strong, proud, a bit of a bad guy. All you need to pull of your clever costume is a plaid flannel shirt, and you wouldn’t be a young man in America today if you didn’t have one of those laying around. Atop your tartan top, this deer head and screen printed wooden “plaque” create the illusion of a wall hanging you might find in a lodge living room. Of course, the costume comes full circle for you with the golden tag that reads "Oh Deer 10/31." Have fun being a big wild tonight, big guy; we know you’ll be the first person back in the morning to help your pal clean his place up. And for the record, in our book, nice guys finish first.